One City Cafe at Bishop Sullivan Center has recently opened its doors to provide healthy meal options for people experiencing homelessness. The cafe used to be called the Community Kitchen. With a new name came change and more space, and the goal to bring people of all backgrounds together to enjoy a nice meal. KANSAS CITY, Mo. — One City Cafe at Bishop Sullivan Center has recently opened its doors to provide healthy meal options for people experiencing homelessness. The cafe used to be called the Community Kitchen. With a new name came change and more space, and the goal to bring people of all backgrounds together to enjoy a nice meal. 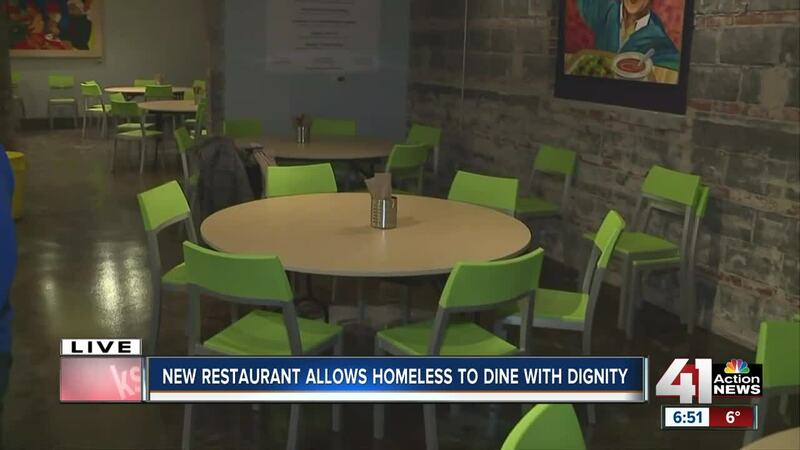 The cafe is restaurant-style seating, where people from various backgrounds are served healthy meals from volunteers. Dwight Tiller, also known as Chef D, specializes in nutritious meals and says the food options will help better serve those who may suffer from heart disease and high blood pressure. The cafe is open to anyone and from 4:30 p.m. to 6 p.m. It's located on 3936 Troost Ave.